One of the easiest snack you could ever make, this is it..It can be made very easily, but the taste is absolutely delicious. Taste so buttery, crunchy and melt in mouth. 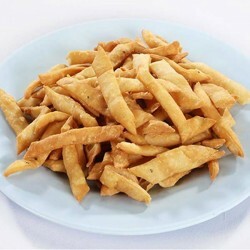 Crusty Khasta Namakpara is a classic, savory snack which is a favorite among all. This namakpara can be served with tea or enjoyed just like that. Namakparas are made with basic ingredients like Plain flour, salt, carom seeds and oil.